SRAS Program Director Renee Stillings, pictured in Khiva, Uzbekistan. SRAS recently celebrated our 20-year anniversary. We’ve also recently developed a new family of websites and a new system for managing increasing enrollments. All these developments have inspired me to take a look at the “evolution” of study abroad to Central/Eastern Europe and Central Asia. Back in the 1990s and even 2000s, American students traveling to this region were, for the most part, studying language and culture. Most were majoring in Russian studies or Russian language, potentially in combination with international relations. At that time, an intermediate knowledge of the local language was a prerequisite for many of the well-established study programs. Programming in Russia outside of Moscow and St. Petersburg was quite limited. Central Asian locations were even more limited. Faculty-led programs also tended to focus on major cities closer to Europe, like Moscow and St. Petersburg, and tended to focus on an overview of history and culture. Such programs were generally led by professors in Russian language or area studies. During this period, SRAS programs also focused heavily on language, but we began including electives, usually one or two, taught in English, allowing students to pick up credit in other areas. Our strategy was, and still is, to focus on topics supported by the overall environment and resources available in each location: art in St. Petersburg, economic development in Vladivostok, politics in Moscow, etc. SRAS students are given a tour of the Cathedral Mosque in Moscow as a standard part of their cultural program to introduce them to more of Russia’s diversity. Starting in the 2010s, the global market for study abroad took a general shift. An increasingly diverse population of students sought increasingly diverse experiences abroad to study in their individual majors. At the same time, a great number of universities worldwide were developing tracks entirely in English for local students hoping to tap into global markets. American students increasingly took advantage of these courses. SRAS still believes that location should be matched to curriculum. For a study abroad experience to be truly impactful, the target city should be able to teach a student at least as much as what they will learn in the classroom. Thus, if students hope to focus on environmental studies abroad, they should look for a location with a unique ecosystem or situation of environmental impact, and where substantial conservation and development work is being done. Irkutsk and the Lake Baikal area in Siberia is well-suited to this. Students who once would have had a very difficult time finding courses in line with their curriculum now have opportunities to choose from. As a former student of engineering back when there were next to zero such opportunities for us, I can appreciate this. Although this has been a global development, our region lagged a bit behind many others in the development of robust programming in English. This has contributed to an ongoing perception that it is necessary to speak the local language to study there – even though this is not always the case. Central/Eastern Europe and Central Asia are also often still perceived as less safe than other locations even though this, too, is often not true. As such, although the opportunities in this region are increasing, it is still not a “mainstream” study abroad destination. SRAS has long sought to combat these outdated perceptions. Moscow, St. Petersburg, and Warsaw now offer quite extensive course lists in English. Especially rich are the offerings in international relations, diplomacy, regional studies, security studies, and international business. In our locations where broad programming in English is not yet developed fully or is too “general,” we offer custom courses, developed in conjunction with local university partners. We constanty update these programs to account for current events, new opportunities, and the evolving interests and backgrounds of our students. Our programming offers unique perspectives, drawing on local knowledge, history, and case studies. 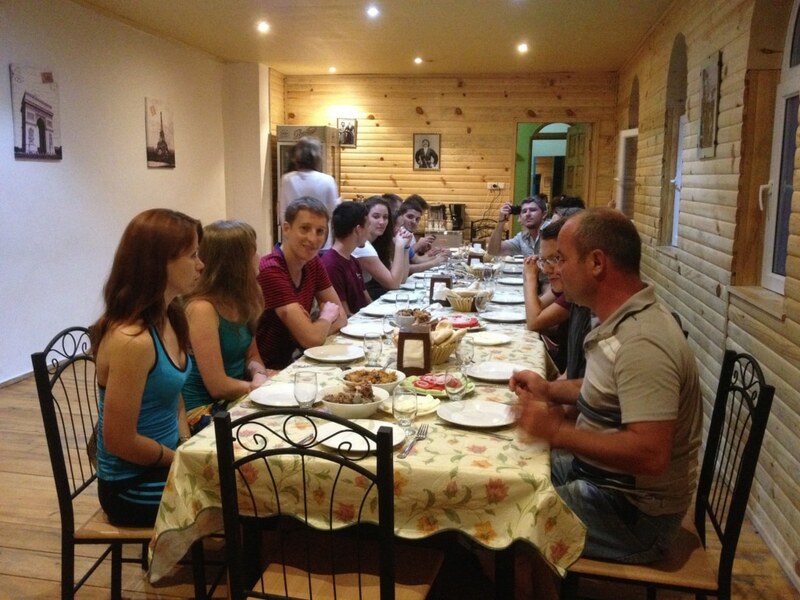 SRAS students take a meal with locals in Svaneti, Georgia as part of one of SRAS’ mulitple programs in the region. Who Should Study in Central/Eastern Europe Today? We have to admit, as study abroad providers we are a little spoiled. While we are not overwhelmed by sheer numbers of students (a la Barcelona), we are constantly amazed by the overall caliber of our students. Studies centered on Eurasia are, in a way, an “honors college,” drawing some of the most ambitious students who are often more independent and adventurous. Our students are more often motivated to get out, meet locals, and really experience their host cities. Many of our students in St. Petersburg in the winter make it a point to travel to Murmansk, above the Arctic Circle, in hopes of seeing the Northern Lights. Students across Russia will often embark on the Trans-Siberian to see more of the country, experience “real Russia,” and practice their Russian with fellow travelers. Students in Bishkek arrange trips to see the beautiful Kyrgyz countryside and the great cities of Uzbekistan. Students in Eastern Europe often visit the Baltics and other Central/Easterm Europe countries … Best of all, many of our students are active contributors to the SRAS Family of Sites, writing about high culture, pop culture, geopolitics, student life and travel, folklore, language, and traditions, and more. Ambitious students from a wide range of disciplines will benefit from the unique opportunities and perspectives offered by Central/Eastern Europe and Central Asia. Students of international relations, for example, should build a portfolio of international experiences and this should include study in this increasingly relevant but oft-caricatured region. Students of environmental studies might not think too often about this region, but what could be more important than understanding the environmental history and policies of the largest country in the world? Students of art and museum science will find St. Petersburg, Russia a fascinating setting in which to explore topics not typically covered in more traditional locations, such as censorship, restitution, preservation/restoration, and more. Finally, students of a broad range of contemporary security issues should consider Poland. This is a country very sensitive to its geography, security, and transition, as it marks this year 80 years since the outbreak of WWII and 30 years since the fall of communism. Our rapidly growing summer school in Warsaw is tackling global issues such as security (including cyber), criminology, genocide, terrorism, and the politics of museums and national memory in a very unique way. In short, we want to see more of your top students, those with ambition and a sense of adventure. There are valuable experiences to be had in this region! In an upcoming issue of this newsletter I plan to address the evolution of faculty-led (custom) study abroad in this region. It has seen an equally fascinating trajectory and we are pleased to be a part of it.